A world beyond the Keyboard! Until I met Alex, I couldn’t imagine using a computer without a keyboard. Alex has a love for numbers and finding answers through data. We were studying economics at the same university. One day, I noticed this guy talking away to his computer and not really using the keyboard. It got me intrigued. As we became friends, I got to know that Alex had very little mobility in his arms and he was using his speech to control the computer! Alex uses Dragon Naturally Speaking and he makes it feel so simple and easy, that I just had to learn it. So, let’s explore how Dragon Naturally Speaking works on the Web. Dragon Works with multiple browsers, for the purpose of this blog we will be working with Internet Explorer. Whenever we launch a browser for the first time after installing Dragon NaturallySpeaking, a prompt appears stating to install Dragon Web Extension. It will enable Commands that allow you to click Web page elements, such as buttons and links, navigate as well as access all the content and functionalities. If the computer is idle for some time, Dragon will go to sleep, give the command “Wake up” and Dragon will be ready to go! Can we give mouse commands using Dragon? Yes, we can! Let’s understand how Dragon uses a concept called the MouseGrid before we actually try it. The MouseGrid breaks up the screen into a transparent three-by-three grid over the screen with the sections numbered one through nine. Notice, that each grid has been assigned a number. You can repeat the process as many times as you need. When the grid area becomes too small to display numbers, you will be able to click the required link or button. When the MouseGrid is enabled, we can use voice command “Click” to restrict the mouse movement and activate the element. 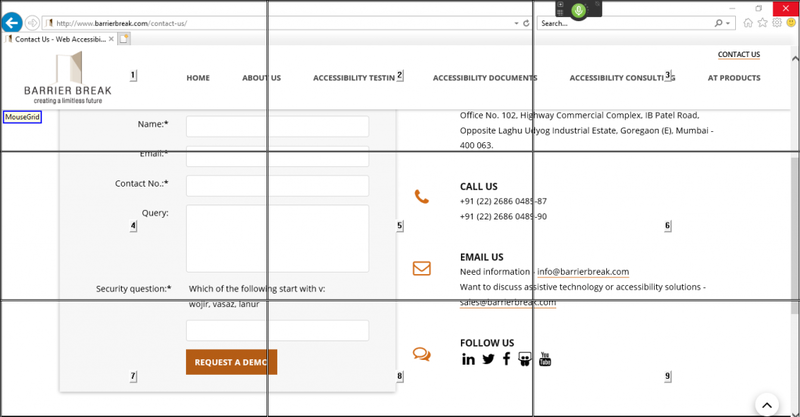 Using the MouseGrid, we can also access elements on a page that cannot be focused using the Tab command. Navigating a web page using Mouse Grid is a tedious process but fun to perform! Why don’t you give it a try and share your views on using speech recognition! Associate Quality Analyst / Team Lead at BarrierBreak. I was more than happy to uncover this great site. Finally, I have found something which helped me. I need to thank you for your time due to this fantastic read!! Amazing stuff with lots of information. Waiting for more updates. Good job in presenting the correct content with a clear explanation. The content looks real with valid information. Good Work.